I mentioned a couple of posts ago that I painted up some figures as presents for my two pals in Tauranga (a city on the east coast of North Island, where my in-laws live), Valleyboy (Kerry) and Chook (Ants). I wanted to give them 10 or so painted figures each from the same period. I had some feel for the periods they game together but couldn't really decide on what to do. Looking back through the posts Chook had made on various fora about periods he be interested in doing, I saw him say this "I've always been interested in VBCW but just don't have the time". Light-bulb moment. "VBCW" is of course the alternative pre-WW2 period "a very British civil war", which pitches various factions against each other in the wake of Edward VIII's marriage to Wallace Simpson. 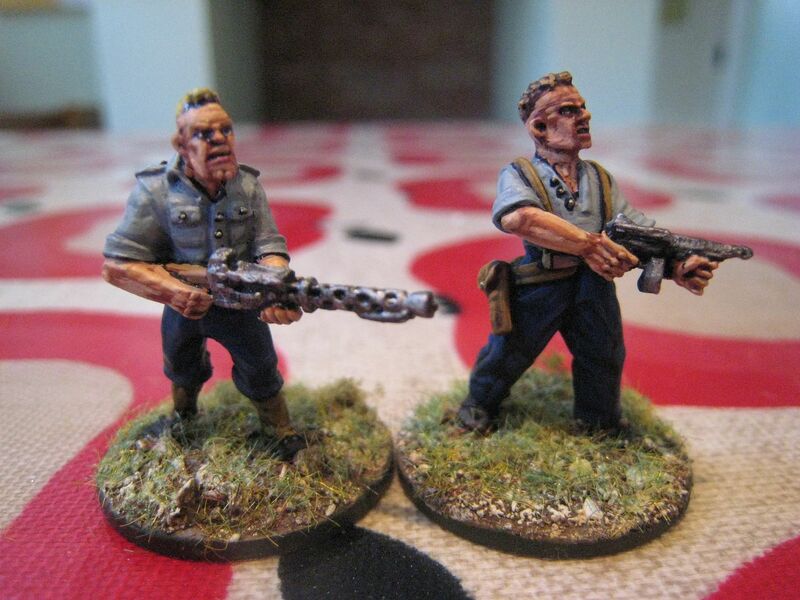 It's been very popular here in the UK - there's always a VBCW game at shows, invariably in 25mm, and it's supported by a mass of figures from various companies, many of which are very inventive (gun-toting clergymen, that sort of thing). 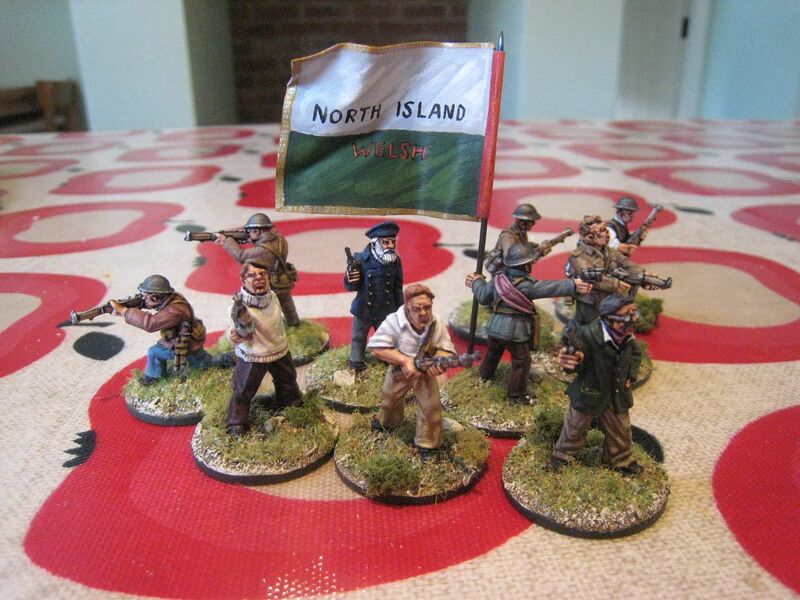 There's no doubt that forming your own militia unit and heading off to fight the Black Shirts, Anglican League or even the 1930s British regular army provides plenty of scope for imagination and creativity. 20th century Imaginations, if you like. I've never really given this period much of a look, but I saw how I could use it to have a bit of fun painting figures well outside my comfort zone, and give Kerry and Ants something a bit different to what they were used to as well. The immediate requirement was to ensure there were 25mm sculpts that I could use as personalities figures for the good gentlemen themselves. 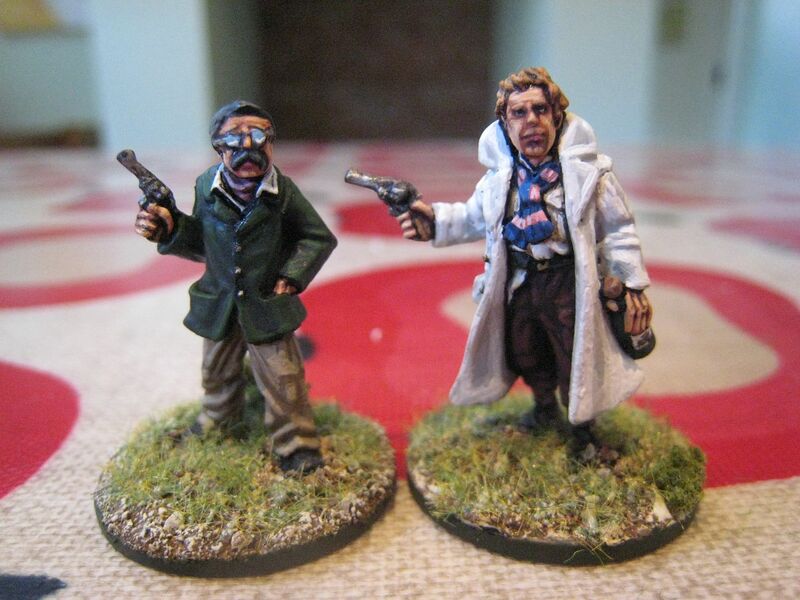 That proved very easy in Kerry's case - the Hemingway figure produced by Artizan in their "Thrilling Tales" range, with glasses, a moustache and a rather dapper appearance. A figure for Ants was a bit harder, but in the same range I saw a figure carrying a bottle of wine and wearing a greatcoat. Ants loves his fine wine so that fitted, and the long coat gave me an idea - Ants, who in real life is a doctor (as is Kerry) could be leading a sort of paramilitary medical outfit, with doctos and nurses dressed in their white coats and uniforms, with a couple of porters and perhaps some more professional friends or relatives. So Ant's faction was born. All I needed was a name. 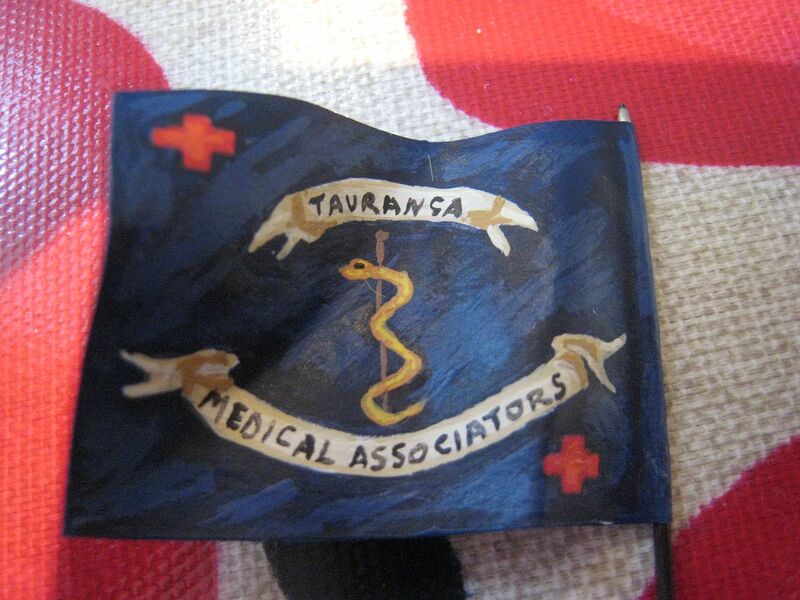 Thinking back to the units raised on the American side in the AWI I decided to call them "the Tauranga Medical Associators". While Kerry is also a doctor, clearly they couldn't both have medical-themed units. Kerry is from Wales originally and is rather fanatical about being Welsh, and being Welsh is also rather fanatical about rugby. So I imagined him leading a unit of ex-pat Welshmen, troubled by the events in the Mother Country and wanting to do their bit - they became "the North Island Welsh", using the form of name that some rugby teams use in England (like "the London Scottish"). Choosing the figures wasn't all that difficult. For Ants' unit I wanted people who looked like doctors, but I only found a couple of figures that could pass off as wearing labcoats. Then it occured to me that many senior doctors in those days probably just wore suits, so there are a couple of chaps here who are "senior consultants". There are two porters in blue-grey shirts and dark blue trousers (modelled on the uniform worn by militia in the NZ Wars) and then some "hangers-on". I imagined the burly bald bloke to be the brother of the bald doctor in the white coat. He's standing with one foot on a box, which I assume is meant to be ammunition but which I turned into a case of wine - the writing says "Mills Reef" which is the name of a winery based in Tauranga. 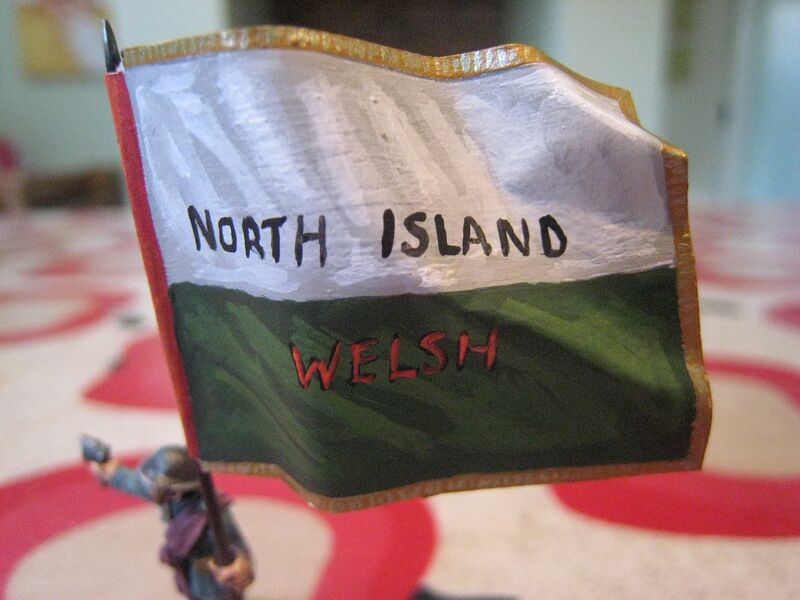 I tied a few of the figures together by painting accessories like scarves and ties in a blue and pink stripe, as a sort of "hospital colours"
The North Island Welsh are just civilians and the odd bloke in some sort of uniform. Most of the figures are from the Musketeer Miniatures VBCW range, with a couple from the Artizan "Thrilling Tales" range again. The latter are a quite a bit chunkier than the former, but they mix ok if based individually. Unfortunately I ran out of time and didn't paint all the figures I had intended, so those extra ones travelled to NZ as raw metal. 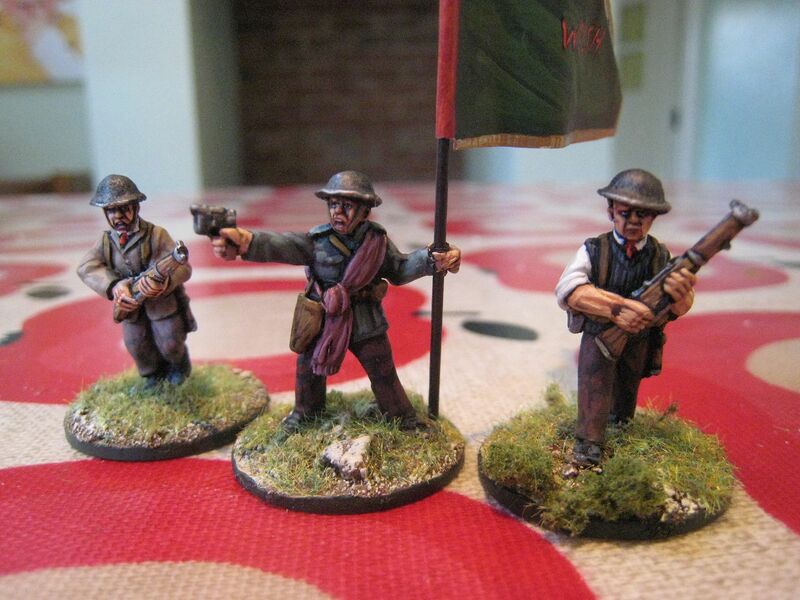 For Ants I had added the heavy machine gun from Empress Miniatures Spanish Civil War range, which is crewed by women and so I thought this would be the nurses' unit (it also contains the standard bearer). For Kerry I had another couple of figures and a pack of dogs from Westfalia Miniatures, as Kerry has a lovely dog who I envisaged faithfully following his master on the battlefield. Once the figures were finished, I needed flags. I did Ants' first: I searched the net for medical symbols I could use, hoping that either Tauranga Council of the NZ medical services would have some suitable coat of arms that I could use. Unfortunately neither did, so I fell back on the traditional medical sign of a staff and snake, with some red crosses. The scrolling effect looks awful - I really couldn't work out how to do it properly. Kerry's flag was easier - it's basically the Welsh national flag without the red dragon in the middle - I decided painting that was biting off too much, really. But I kept the "Welsh" in red lettering. So there you go. The guys seem inspired to have a crack at this period. I had assumed they'd forge their own NZ backdrop, but I gather they are building their campaign around Kiwi units landing in Wales. Sounds a lot of fun. The photos are a bit crappy again - they were taken in haste just before I left home to fly to NZ (I'm ashamed to say I was painting the flags while the Kiwi was doing all the packing)! You can see other better ones taken by the lads themselves here and here. 18 figures. Painted November/December 2013. Actually, this blog's 7th anniversary was a good 6 weeks ago, but I was in NZ at the time so couldn't post anything, and since then work has been worse than manic - hence the lack posts, I'm afraid. I usually use this moment to reflect on the past year and make some plans for the forthcoming year. The past few years have seen such plans becoming ever more tentative, as painting time continues to vanish and my attention wanders across various periods. You'd have thought that reduced painting time would result in more focussed and concentrated effort, but I've found the exact revers - that I've butterflyed more rather than less. 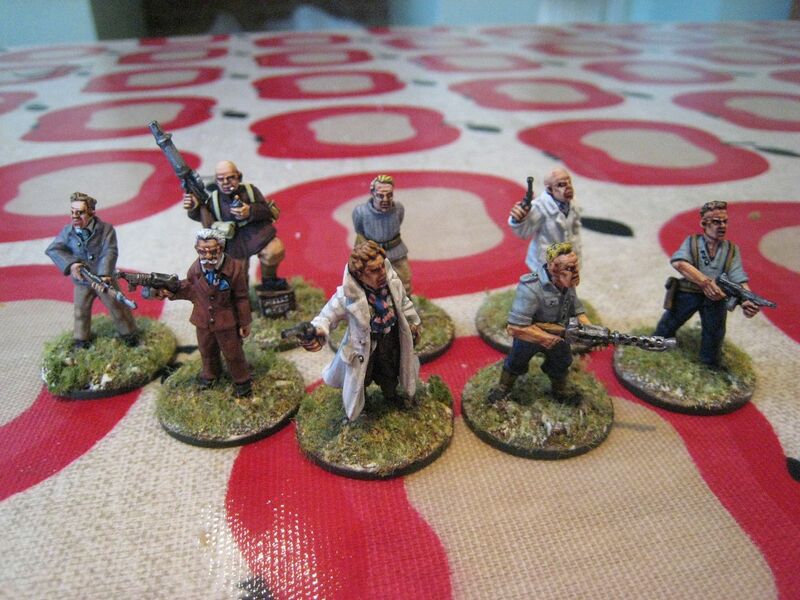 Last year will also be remembered as the year when I began painting lots of figures for other people. I don't intend to make a habit of that - the reality is that I have neither the time nor the inclination to take on commissions, but I am happy to do so in very particular circumstances. As regular readers know, I'm working on various things for Bill Nevins and that will continue this year (his mass of finished 42nd Foot is pictures above. 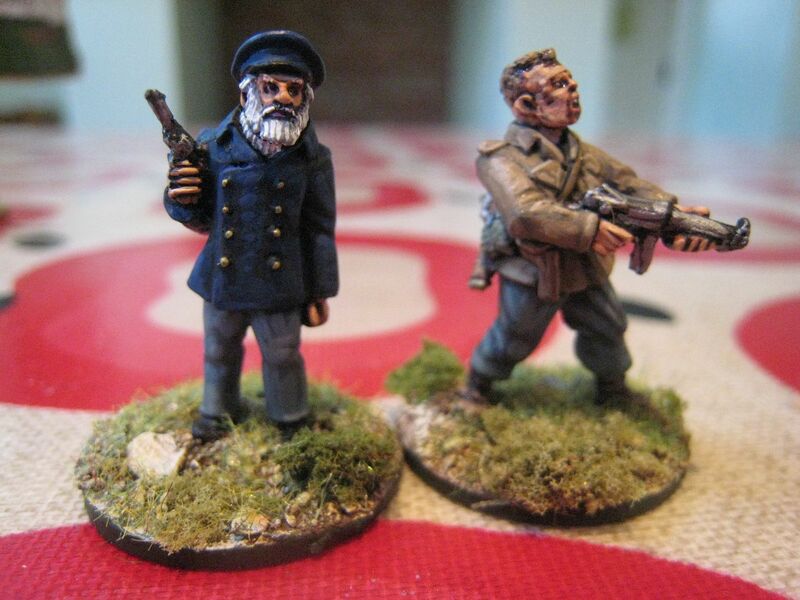 I also painted 20 figures for my two friends who I visited in New Zealand, Kerry and Ants - more on those in a few days (and do visit Kerry's brand new wargaming blog here). - AWI: 115 foot (including 50 figures for Bill). - 1815: 105 foot, 5 horses and 9 guns. That gives me 305 points, which is rather disappointing. "Other" means South American Wars of Liberation, Great Paraguayan War and the stuff I painted for Kerry and Ants. The first two are projects that kicked off last year as a result of new ranges being released. I have flirted before with "Liberators" in 15mm (see here), using the excellent range produced by John Fletcher and Grenadier Productions. 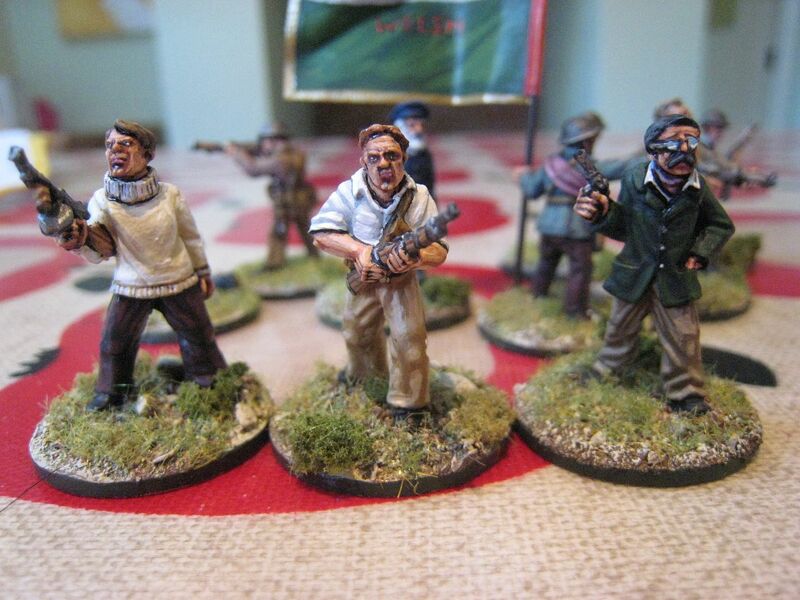 Parkfield Miniatures began a range in 25mm a year or so ago and then Orinico Miniatures appeared last year. 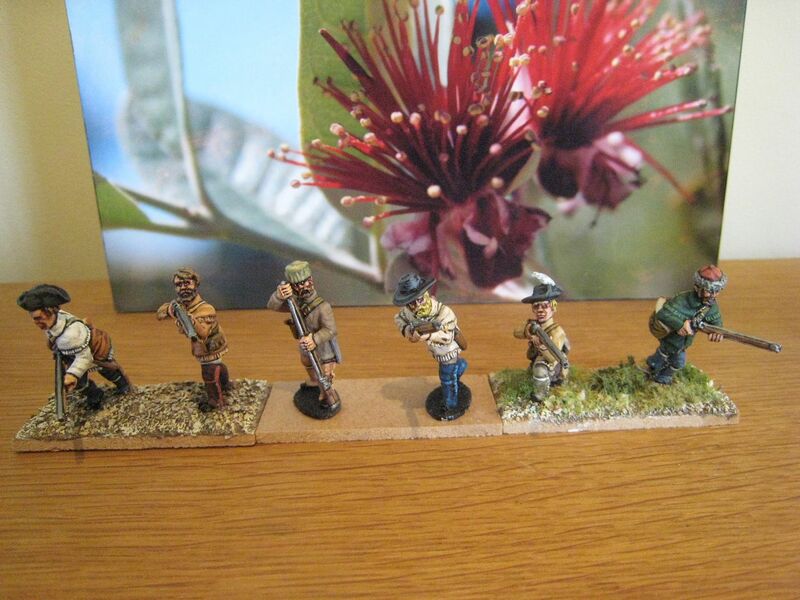 My interest in doing this period in 25mm rather than 15mm was piqued by the Parkfield range and by further research which indicated that the size of units would be fine for 25mm (i.e. the 16-24 figures per unit that I prefer). I bought a couple of packs of Orinico infantry on spec and I'm now close to finishing my first unit, of Irish volunteers. Hopefully that will be on the website shortly. As it happens, Osprey have just released an Essential History by John Fletcher on these wars, which is worth picking up if you're interested (together with his invaluable wargaming supplements). - see what's in the First Carlist War leadpile and paint that. 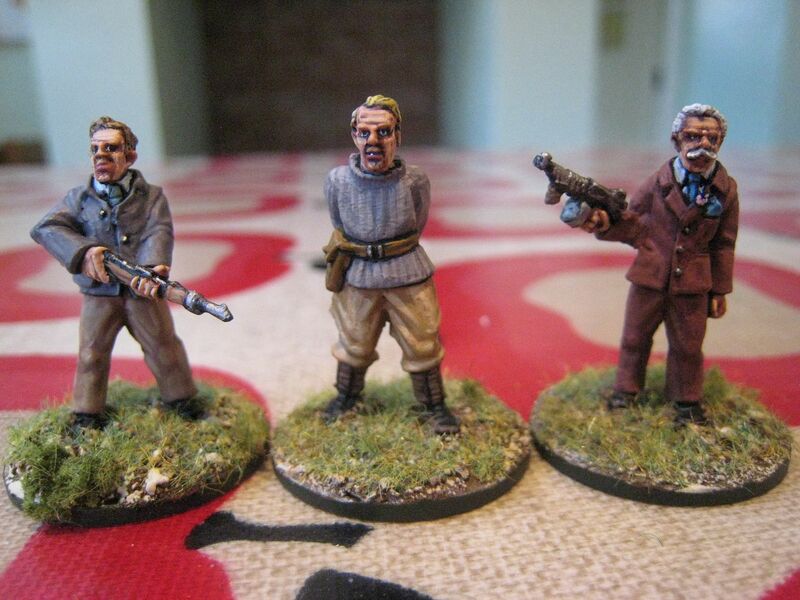 So other than 3 command vignettes I don't plan on painting any Napoleonics this year. I want to focus back onto the AWI and made a bit of progress with the other periods. 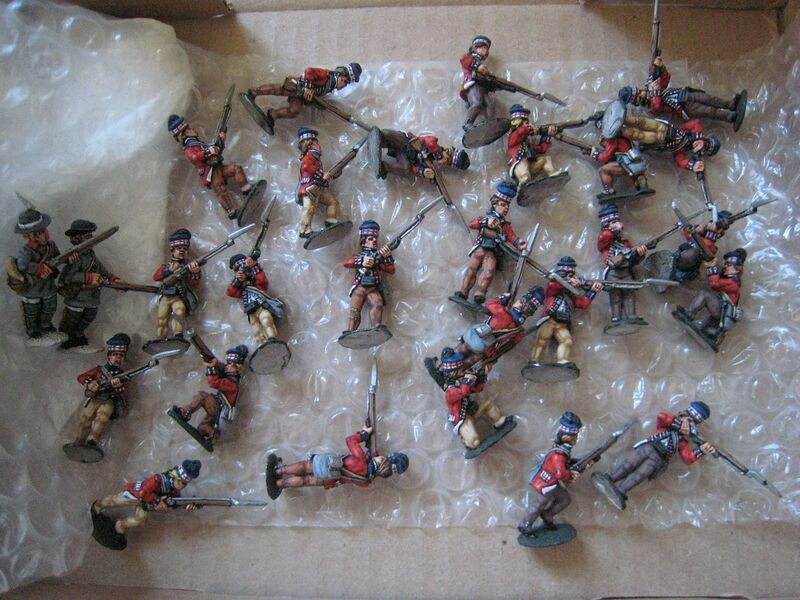 It's going to be a good year for the AWI - lots of figures from King's Mountain Miniatures, the new Perry Continental dragoons, Perry plastic Continental infantry out in April, and no doubt lots more metals from both Perry and Fife & Drum. 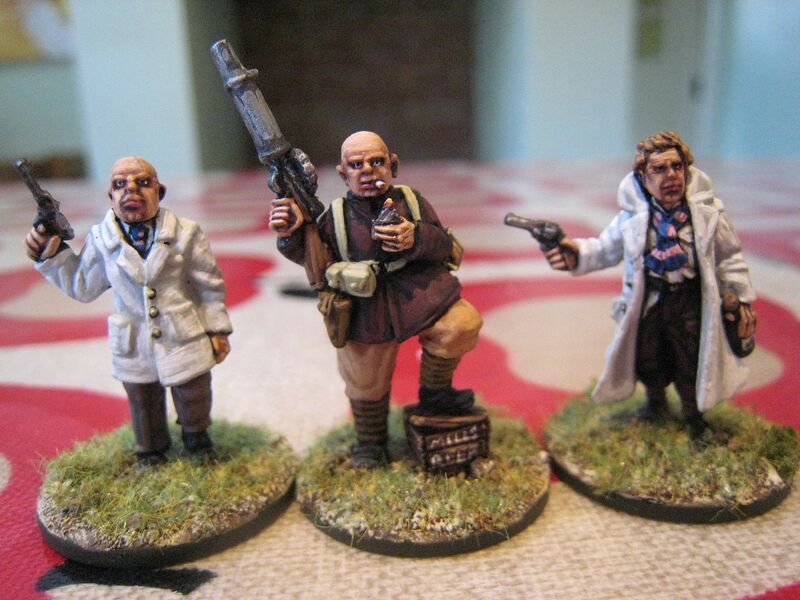 And, Steve Jones may be putting on an AWI game at Salute - how fab is that? !